Today in shop we build a simple FM bug that transmitted on the lower band of FM around 88 Mhz. 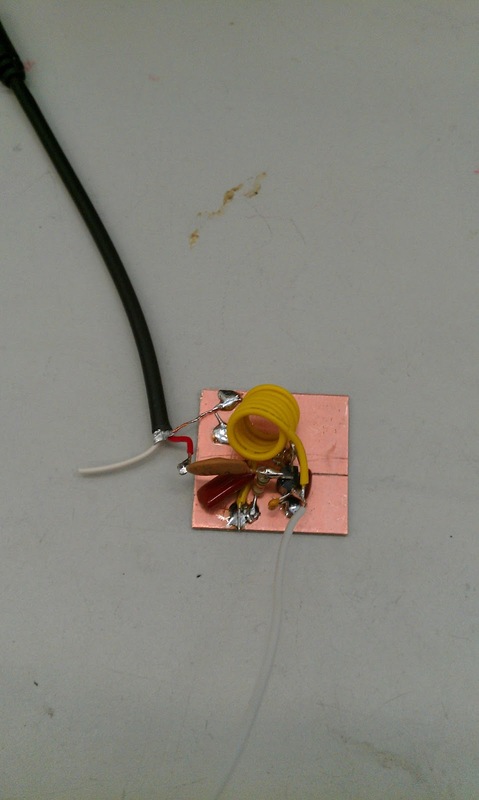 Picture below is the circuit in dead bug construction, ideal for RF experiments. This did work on the breadboard but it was very unstable. The resonant (fundamental) frequency of this circuit is around 9.777 Mhz, so how does it work on 88 MHZ? Well in RF oscillators there is something call harmonics or overtones. When a circuit is oscillating it also produces a odd multiple of that original frequency, at the same time that multiple of the frequency drops in amplitude by about half (-3db) each time it's divided in a logarithmic form. As you can see the 9th harmonic is around 88 Mhz, as a rule of thum anything over the 11th harmonic is so small it is unusable and drifts exponentially to the fundamental and is very difficult to use unless you have a very stable fundamental frequency (ie. rubidium standard). This is also very difficult to measure with a scope, the scope will load down the circuit and change capacitance of the tank circuit. We used a frequency counter not connected to but near by the antenna and a analog FM radio receiver. Overall this was a great experiment to demonstrate FM modulation, RF prototyping and using a frequency counter.